What is Predator DNC ? Predator DNC software is designed to network all of your CNC machines, robots, PLCs and part markers. Predator DNC manages your CNC programs, offsets and parameters. It supports a wide range of CNC communications for dripfeeding, downloading, and uploading via parallel, RS-232, RS-422 Ethernet and wireless Ethernet. Why use Predator DNC ? 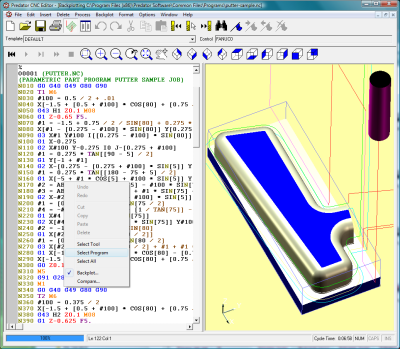 Predator DNC software supports up to 4096 CNC machines, robots, PLCs and part markers per PC. Simultaneously send, receive, dripfeed, download, upload and DNC programs, offsets and parameters. Organize your CNC's by grouping them per building or cell. Network your Predator PC’s to support an unlimited number of CNCs. NOTE: Multiple CNCs per PC requires compatible hardware such as Predator Express, Flex, Flex/2, Flex/N or Flex/W series. Stop using switch boxes, diskettes, paper tape, laptops, or some proprietary hardware contraption to communicate with your CNCs. Predator DNC provides a true network solution insuring the latest CNC programs are pulled from your file server and when changes or revisions occur the edits are stored back on your file server. The entire process will become more reliable and everyone will become more productive. Eliminate walking back and forth between your CNC and your PC with Remote Request. Remote Request allows the operators on the shop floor to dripfeed, download and upload CNC programs directly from their CNC controls. Predator DNC software supports a number of remote features including Remote Autoname™ for simplified uploading of NC code remotely from the floor, Remote Messaging for visibility back to the DNC server PC when errors occur, and an unlimited number of Remote Commands per CNC. Leverage existing shop floor PCs or Windows based CNCs with Predator DNC Connect to initiate downloading and uploading. Its big button interface is easy to use and supports touch screen PCs. NOTE: Predator DNC Connect is licensed per site not per PC and it does not include the Predator CNC Editor. Predator DNC software works as a gateway between your CNC's and your Windows, Linux, Solaris, Mac, VMS or Unix network server. Predator DNC extends the networking flexibility of Windows® to your CNCs, PLCs and robots. Support for wired and wireless Ethernet, hidden network shares, folder shortcuts and active directory are included. Predator DNC software includes a Server Safe™ option for error free DNC program transfers even if the network server should crash or fail during DNC communications. This is one of many reliability features that have been engineered into Predator DNC. Stuck with an old DNC program that won't multi-task? Predator DNC can support up to 4096 CNCs, robots, PLCs and part markers simultaneously. Background operation even includes an option for running Predator DNC as a Windows Service. Predator DNC's multi-threaded design leverages hyperthreading and multi-core CPUs to balance the number of CNCs, PLCs and robots. Over 100 DNC Objects are included with the Predator DNC program. These can be combined to automate a number of shop floor processes. Options include email, printing, VB scripts or tracking in Microsoft Excel, Microsoft Access, Microsoft SQL Server or Oracle. Often Predator DNC Objects are used to support CNC communication protocols for Bostomatic, Bridgeport Easylink, Fanuc Protocol A/Expand A, Fagor, Heidenhain, Kermit, Okuma B, Mazatrol, Xmodem and many others. Every Predator DNC software license includes a Predator CNC Editor software license for intelligent CNC editing, side-by-side file compare and 3D animation and backplotting.